1910 Picture Postcard of George St., Limericak addressed to Yeovil franked by a ½d Yellowish-Green, SG 218, tied by a very fine LIMERICK JUNCTION SKELETON DATESTAMP - Latest date of two recorded?? 1910 BRITISH LEVANT 1½d Pale Dull Purple & Green, SG 16, strip of Three tied to Registered envelope from Smyrna to London. 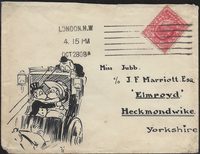 1912 EXPRESS ENVELOPE FRANKED BY A 3d, SG 285 and 2½d, SG 284, tied to envelope from Hammersmith to Germany with advertising sticker in red on the reverse. 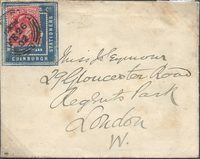 1911 EXPRESS ENVELOPE TO GERMANY franked by an Edward VII 2½d, SG 230 and 3d, SG 232, tied by very fine 'LONDON W.C.' circular datestamps. 1909 Postcard to Derby franked by a ½d Yellow-Green, SG 218, tied by a fine BIRKENHEAD XMAS CROSS CANCELLATION. 1905 Postcard from Northampton to Great Yarmouth showing a fine PETERBOROUGH/SORTING TENDER cds, W539. 1907 Postcard from Greenock to St Andrews showing a superb "R.M.S. "LORD OF THE ISLES" CACHET IN BLACK. 1903 LONDON TRIAL CANCELLATION WITH '59' IN BARS AT RIGHT cancelling a 4d Green & Brown, SG 436 - see "Collecting Squared Circles", Page 281, Fig 76. Very Rare. 1902 4d, SG 236 and ½d, SG 216 tied to Registered envelope from Pier Street, Hull to Norway. Attractive. 1912 2d Grey-Green & Carmine, SG 292, tied to 3d Registered envelope used within London. 1905 Postcard addressed to Pentney near Swaffham franked by a ½d, SG 217, tied by a very fine MIDFORD/BATH temporary rubber datestamp in Violet. 1906 Envelope addressed to Wigan franked by a ½d, SG 217, tied by a very fine Type 4 Wigan XMAS cancellation. 1908 Postcard franked by a ½d, SG 217, tied by a very fine NORWICH/1908/XMAS rubber datestamp. Posted in advance for delivery on Christmas Day. 1906 Postcard to Liverpool franked by a ½d, SG 217, tied by a fine Type 4 Birkenhead 'XMAS' cancellation. 1906 Postcard to Liverpool franked by a ½d, SG 217, tgied by a very fine Type 4 Liverpool 'XMAS' cancellation. 1902 "HARVEY & CO/WHOLESALE/STATIONERS/EDINBURGH" Advertising envelope used from Perth to London franked by a 1d SG 219 and tied by a Perth circular datestamp - stamp hinged on. 1908 Postcard used locally franked by an Edward VII ½d, SG 217, tied by a very fine Type 4 READING "XMAS" cancellation. Very Scarce. 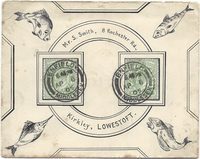 1906 Edward VII ½d Cross Attached pair, SG 218a, and two 1d Scarlet, SG 219, tied to envelope from Seaford, Sussex to France. 1907 Postcard to Kilmarnock franked by a ½d, SG 218, tied by an Ardrossan cds showing on the same side a "GLASGOW AND SOUTH WESTERN RLY/P.S./JUL 1907/JUNO./STEAM VESSELS" cachet in violet. 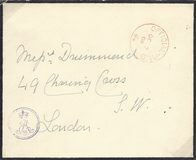 1902 Parcel Post Label, STREATLEY (Under Dunstable), franked by two 2½d Edward VII, SG 230, showing a very fine STREATLEY/DUNSTABLE rubber cancellation in Violet. 1909 Postcard depicting on the front "Souvenir Card of the 퓜ANCHESTER POSTAGE STAMP EXHIBITION & PHILATELIC CONGRESS..." and on the reverse franked by ½d Green, SG 218, tied by a very fine Manchester Exhibition cds. 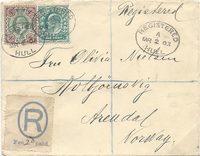 1907 3d BROWN REGISTERED "INSURED" Envelope to Germany franked by a 1/- Green & Carmine, SG 257, tied by a very fine STAFFORD circular datestamp. 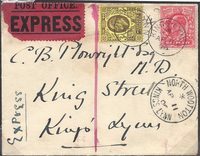 1906 Registered EXPRESS envelope used locally in Kings Lynn, franked by a 1d Scarlet, SG 219 and 3d Dull Purple/Orange-Yellow, SG 232, tied by superb KINGS LYNN cds. Attractive. 1905 Parcel Post label, Graemsay, (Under Kirkwall) franked by a 3d, SG 232 wityh a superb GRAEMSAY/STROMNESS R.S.O./4 MAR.05/ORKNEY cds in Violet. 1904 3d Brown Postal Stationery Registered envelope to Paris franked by a 1½d Dull Purple & Green, SG 221, tied by superb Bridlington circular datestamps. 1903 Parcel Post label, Biggleswade (BGH) franked by a 4d SG 235. 1906 Parcel Post label, St. Neots (SCG) franked by a 5d SG 242a. 1903 Parcel Post label, Bedford, Kimbolton Road franked by a 1d, SG 219 and 6d, SG 245, tied by circular Bedford rubber handstamps. 1903 Parcel Post label, Runfold (RNF) (Under Farnham) franked by a 4d Green & Brown, SG 236, tied by a circular Farnham rubber handstamp. 1909 Parcel Post label, Farnham (FJ) franked by a 6d Slate Purple, SG 246, and tied by a very fine Farnham.Surrey/M.O.&.S.B cds. 1912 Parcel Post label, Farnham, Ridgeway Road franked by a 4d Breight Orange, SG 286 and 6d Dull Purple, SG 297, and tied by Ridgeway Road/Farnham cds. 1912 Parcel Post label, Heath End (HQD) under Farnham franked by a 5d Dull Reddish Purple and Blue, SG 293, tied by a Heath End/Farnham cds. 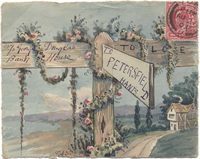 1903 Parcel Post label, CROYDON, Brighton Road. A fine used example. 1902 BOARD OF EDUCATION 1d Scarlet, SG 084, tied to O.H.M.S. Printed Envelope with "HER" adjusted to "HIS", and addressed to South Kensington, by a London cds. 1903 Postcard to London franked by a ½d Blue-Green, SG 215, tied by a very fine IPSWICH.SORTING.TENDER/NIGHT/DOWN cds. 1908 Postcard from Falmouth to Essex showing a superb 'IPSWICH-SORTING-CARRIAGE/DATE/DOWN/DAY' cds, W 524. 1911 Registered ADVERTISING envelope franked by a 3d Dull Purple/Orange-Yellow, SG 232 tied by a REGISTERED/BELFAST oval datestamp in VIOLET addressed to Leeds, on the reverse advertising "BUCKLEY'S BETTING TICKETS ARE THE BEST" etc. Unusual! 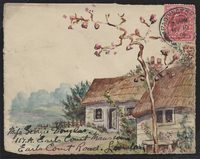 1908 Postcard franked by a ½d, SG 218, tied by a fine I.O.M. "KNOCKALOE CAMP/PEEL" skeleton datestamp addressed to Whitehaven and redirected to Penrith, franked by another ½d, SG 218 and tied by a fine CARNFORTH & WHITEHAVEN T.P.O. cds. 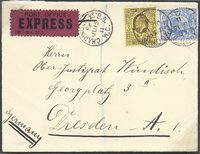 1909 EXPRESS Envelope addressed to Germany and franked by a 2½d, SG 230 and 3d, SG 233b, tied by fine London circular datestamps.